Sophie Munns carried out a Residency at PLANTBANK , new Seed Research Facility at the Australian Botanic Gardens, Mt Annan, NSW in Late April, early May. Updates posted at the Homage to the Seed FB page + this blog. will open her studio on Saturday 12th and Sunday 13th of April, both afternoons from Midday to 5pm. An up-coming Artist Residency at PLANTBANK , onsite Seed Research Facility at the Australian Botanic Garden, South West of Sydney, NSW is the reason behind this free weekend event. with postcards + small and large works available for viewing and purchase. There'll be a 'pop-up' cafe selling afternoon tea as well. We're catering for all-comers... those wishing to see new work, anyone curious to learn more about the Plantbank Residency and for those who like to drink tea from fine china... we'll be offering that too. In aid of fund-raising a donation of lovely fine china tea cups for us to use also gives you the opportunity to purchase your cup and saucer if you wish. ADDRESS: 48 Meemar St, Chermside , closest corner Inga St, a few minutes from Burnie Brae Park. To learn more about this event follow Homage to the Seed page on FACEBOOK or send an enquiry here. 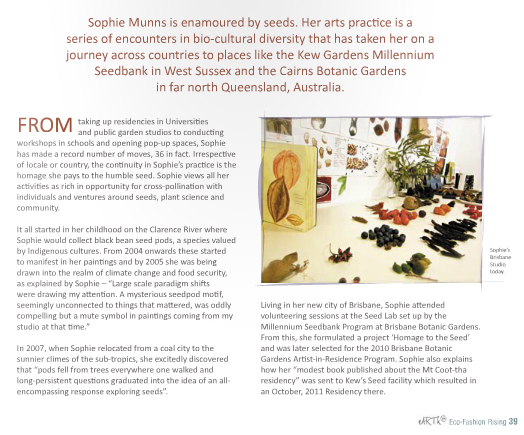 Sophie Munns: 'A new video put together in the last week by The Global Crop Diversity Trust in Bonn, Germany features my artwork with a discussion of Seed diversity and the Homage to the Seed project. Late last year The Crop Trust approached me and a section of the painting below was used on the Crop Trust's Holiday greeting card.' Read more on the video and the Crop Trust at the current STUDIO blog post here. To read more about this artwork visit the Homage to the Seed blog post December 24. A close-up section of this artwork featured on the Global Crop Diversity Trust's Christmas card this year... a fitting connection for this work which refers to the Planet's critically important Seed Heritage from across time and place... essentially a celebration of Bio-Cultural Diversity which speaks to the mission of the Trust ... to preserve diverse and invaluable crop varieties from around the globe well into the future! Click to read the LATEST E-NEWS BULLETIN on January - February news! Click eARTh E-Mag to read a 4 page article on the artist's work in the FEB Mag. To find out about the recently launched Seed.Art.Lab Studio, home base for the Homage to the seed project and the artist click here. The studio Seed.Art.Lab has opened each Thursday or by appointment. Two student interns at currently doing Studio stints. The Studio closed between Xmas and New Years whilst Sophie Munns was on a short Artist Residence at Springbrook National Park in S.E.QLD. Read more here. For all enquiries email the artist here or make a time to visit if you are in Brisbane... call m : 0430 599 344 . Visit FB: Homage to the seed for updates! Below: Page 40 of 4 page article in eARTh E-Mag on the work and project conducted by the artist.